India’s successful campaign in ICC World Cup was largely due to some great bowling and fielding. 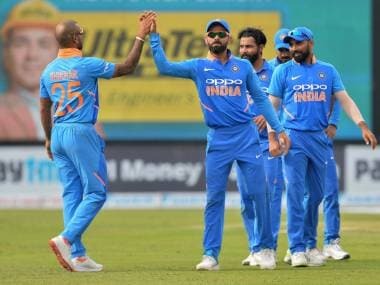 India managed to pick ten wickets in all their league matches, a rare feat these days in limited over matches where bowlers are intent on just keeping the runs down. 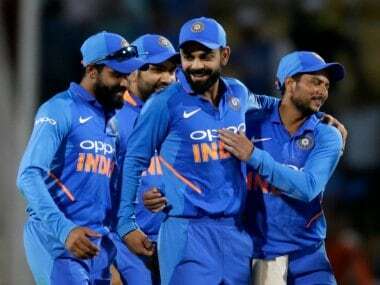 We saw shades of the same aggressive bowling lineup as India skittled New Zealand for 189 in their first warm-up match for ICC Champions Trophy. If anything, this bowling lineup looks more dangerous than the one that played in the 2015 World Cup. 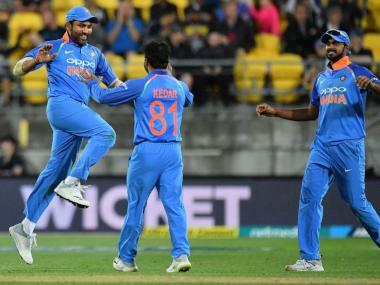 Mohammed Shami, playing his first ODI for India after 2015 World Cup semi-final, was his usual aggressive self as he started the rout picking three wickets with the new ball. 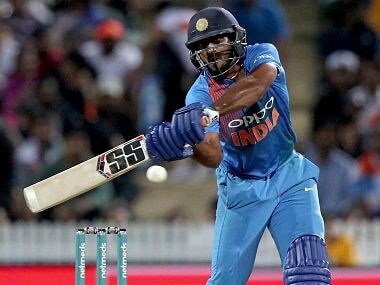 His partner with the new ball, Hardik Pandya, was guilty of pitching it short once too often and was duly punished by Luke Ronchi, New Zealand’s makeshift opener for this match. The Oval pitch offered a lot of bounce and Pandya showed his inexperience by getting carried away and trying to test the middle of the pitch once too often. As the only seam bowling all-rounder, Pandya lends balance to this team. He needs to get his act together soon and stick to bowling a fuller length even on a pitch with extra bounce. The experiment of giving him the new ball on Indian pitches was mildly successful but they can’t continue with that in England where someone like Bhuvneshwar Kumar can use any assistance that is on offer to make early inroads. While Shami was coming back after a long layoff, Umesh Yadav, Bhuvneshwar, and Jasprit Bumrah are fresh from a successful home season. Umesh, in particular, was impressive with his pace and variations. He is without a doubt one of the most improved bowlers in world cricket over the last year. He always had the pace but now he has added great control and variations that make him a handful in any conditions. Both Umesh and Bumrah hurried the batsmen with pace and bounce on more than one occasion. Bhuvneshwar was his usual accurate self and got a hint of movement with the new ball even though he was introduced late into the attack. The form of seamers is going to give skipper Virat Kohli and coach Anil Kumble some selection headaches. Bumrah, being the least experienced, may sit out the first match. It will be harsh on the young tearaway who has proven himself as a quick learner. It’s not the worst problem to have for Kohli who will know that whatever combination he chooses, he is going to have a lot of options on the field with all his seamers having different styles and strengths. With Ravichandran Ashwin and Ravindra Jadeja, Kohli has the most accomplished spin bowling pair in world cricket. While Ashwin kept everyone guessing with his variations, bowling three leg breaks in his six-over spell, Jadeja was his usual accurate self as he settled into a rhythm early to pick two key wickets. Kohli would like to play both his spinners unless India encounters a real seamer-friendly deck. Both Jadeja and Ashwin are at their most lethal while bowling as a pair, but if it comes down to choosing just one, Kohli may want to go with Jadeja simply for his exceptional fielding abilities. India never looked troubled in their chase and were way ahead of the Duckworth-Lewis target when rain interrupted play. The biggest plus for India was the form of their batting superstar Kohli who had a poor Test series against Australia and an indifferent Indian Premier League by his standards. He unleashed his full array of strokes against the New Zealand fast bowlers who had earlier troubled Ajinkya Rahane and Shikhar Dhawan with extra bounce. Standing way outside the crease, Kohli drove with authority and was also severe in punishing anything short of a length. Dhawan looked in trouble against the new ball but soldiered on to score 40 in a useful partnership with his captain. Rahane too never looked settled and got out trying to play the pull shot. The question of who will open with Rohit against Pakistan is far from settled right now, the next warm-up match may offer some answers. At the moment, Dhawan may be slightly ahead in the pecking order. Dinesh Karthik looked miserable in the middle and will be cursing himself for not being able to make an impression. He had a solid List A and IPL season this year and this might be his last chance to play in India colours. His poor show means India’s middle order picks itself. MS Dhoni had a decent outing as he flayed a few short and wide ones. His partnership with Kohli is going to shepherd India’s middle order again, especially in a chase. Overall, India will be happy with a solid outing. This team is always going to be a title contender in any ODI tournament anywhere in the world but there were some question marks over the form of a few players who were out of form or were coming back after an injury layoff. Those doubts are put to rest now and the team looks set to defend its title.